After getting some well overdue lunch back at the cottage, as it was getting on for 6pm, I watched with a heavy heart, the beautiful late afternoon sunshine being overwhelmed by a congregation of clouds, rapidly going about their billowy business without so much as a thought for my future requirements. Like the weather outside, the prospects of getting a decent sunset were looking dimmer by the minute. I took the 20 minute drive down to Dunraven Bay anyway, as I wasn’t going to be bullied by these nebulous rascals. 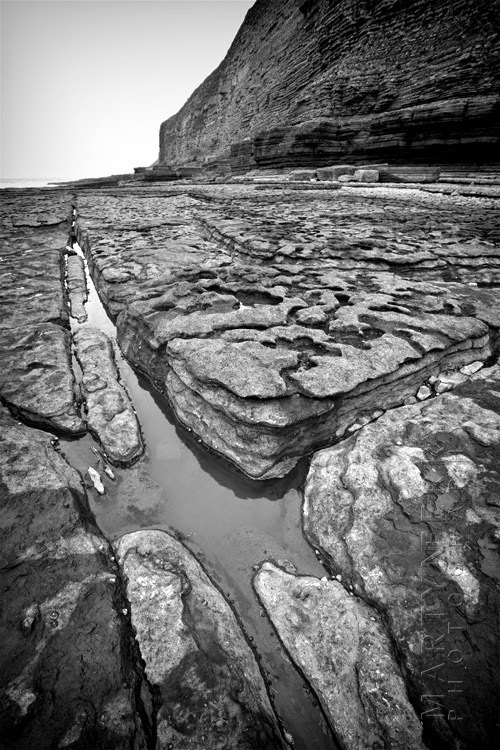 I had a thought to mooch around the interesting rock formations that line the coast along here. Thankfully this time of year the sea was out of an evening, which is useful because it exposes the myriad rocky formations along the beach, and as the tide along this coastline is the second highest in the world, making it a tricky prospect should you not have your wits about you, it can easily catch out the unwary. The oldest rocks along here were laid down about 3 million years ago, when Wales would have been south of the equator and amphibians were the dominant land animals. Since then, various strata have been deposited and myriad earth movements have caused folding and fracturing of the Jurassic rocks, so they are well worth an exploration on an austere evening. I was drawn to this solitary rock. It could have been put there by someone, but I prefer to think that it was deliberately deposited by the outgoing sea. Different layers of limestone in various stages of erosion. I pretty much had the beach to myself, thanks to the late hour and the agitated, blustery conditions sweeping in from the Atlantic, and I was quite content to range over the craggy ground looking for interesting viewpoints in the fading light. I could see greys, yellows, browns and reds amongst the eroded hunks of ancient rock, from the smooth egg like pebbles on the ground, small enough to be held, to the monstrous rugged slabs of limestone stacked 200 foot high above me. But thanks to the gloomy light, their colour was rendered so subtle as to be almost uniform. Water channels over thousands of years have eaten through the rock. Millions of years represented via the rock strata in the cliffs. As it happens, just when I thought I’d seen the last of the sun, the clouds did open up and everything briefly got brighter, so I quickly found a couple of suitable spots to get some costal views, before the clouds closed on me again, and the rain, carried by the blustery wind, started hitting hard. You can see the direction of the wind from the ripples in this rock pool. This was about as bright and colouful as it got all evening. Once I was done, or considering the way the weather harried me off the beach, perhaps I should more accurately say, once it was done with me. I stumbled back to the car over the boulder strewn shore and drove back to the cottage with dinner in mind, and considering the forecast, not much hope of a sunrise the next morning.